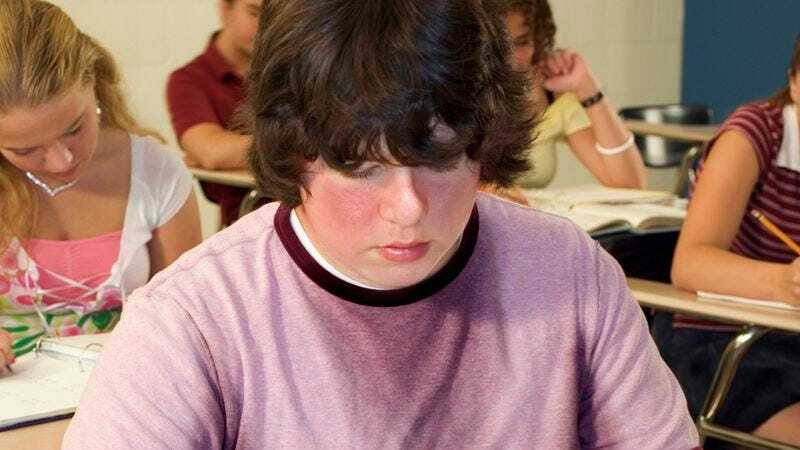 TRENTON, NJ—Having arrived directly from the school gym where he played three-on-three basketball for 45 minutes, local 10th-grader Alex McKean reportedly spent the entirety of his math class Tuesday absolutely drenched in sweat. Early reports confirmed that the 15-year-old, who first entered the classroom with his sweat-stained T-shirt clinging to his body, immediately sprawled out on a chair in the back row, with beads of perspiration continuing to stream down his forehead, neck, and arms. Completely flushed in the face, the high schooler could also be heard panting heavily well into the first five minutes of the lesson as he tugged repeatedly at the front of his shirt in an effort to cool himself down. In addition to leaving all students in his vicinity visibly disgusted, McKean’s powerful body odor reportedly deterred his teacher from walking anywhere near his section of the classroom for the duration of the lecture. Following the bell, sources confirmed that McKean made a quick stop at a water fountain before showing up to his American history class with water still dripping from his mouth.